Gary Webb murder conspiracy: Was he 'suicided'? "It is widely known the USA has many Weapons of Mass Destruction, and the latest scuttlebutt on the Internet is that one of these, the HAARP was used to create the massive earthquake in the Indian Ocean. Suspicions are rife especially when there are so many coincidences, the biggest being this quake occurred 12 months to the day from the last big quake in Iran. There seem to be many anomalies in the weather patterns of this planet and they are becoming more frequent, strange weather patterns that never occurred before, for instance, snow has fallen over the United Arab Emirates for the first time ever, in a country that has an average summer temperature of 50c. 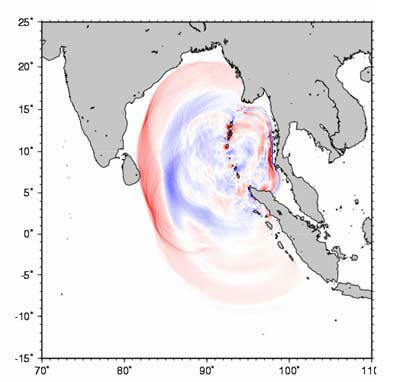 Was killer tsunami a manmade disaster? Was Tsunami seismic (tectonic) warfare? Cardinal Joachim Meisner's (right) remarks unwittingly outraged organized Jewry. which damns any view that doesn't adequately conform to the 'Holocaust'-as-unique-and-greatest-tragedy-of-history myth. A German cardinal on Saturday said he regretted comparing abortion to the genocides carried out by Hitler and Stalin, which sparked a public outcry here, and claimed to have been misunderstood. 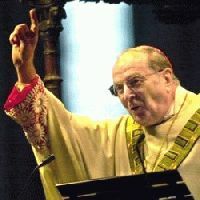 "I regret that it has got to this pitch," the Roman Catholic Cardinal of Cologne, Joachim Meisner, said, stressing that he would never have made such a comparison if he had thought it could have been open to misinterpretation. Chertoff involved in Vince Foster death coverup? 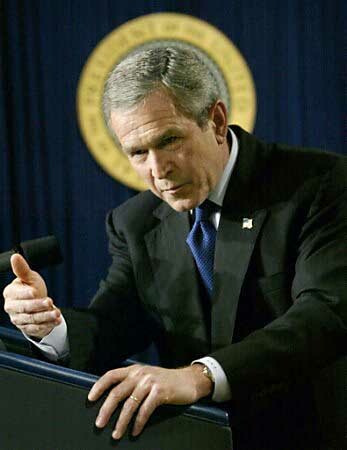 While President George Bush said some of the right things about the need for religion in the Oval Office, his record (including the betrayal of the unborn, support for illegal aliens, 'gay' partnerships and Zionism), hardly suggests him being the sincere, even sainted Christian envisioned by his followers (see photo right). Nevertheless, his remarks do point to the war that is being waged for America's identity. On January 11th President Bush said that he doesn't "see how you can be president without a relationship with the Lord," but that he is always mindful to protect the right of others to worship or not worship. Mr. Bush told editors and reporters of The Washington Times in an interview in the Oval Office that many in the public misunderstand the role of faith in his life and his view of the proper relationship between religion and the government. KGB and STASI reinforce Homeland Security. For whom? Do Jews run Hollywood? You bet they do--and what of it? The Bush Administration's "Enabling Act"
In one of the most successful marketing campaigns in modern political history, the "abortion rights movement" – with all of its emotionally compelling catch-phrases and powerful political slogans – has succeeded in turning what once was a heinous crime into a fiercely defended constitutional right. Roe v. Wade rallies held across U.S.
Should anti-Bush journalists be tried as 'spies'? The 9-11 WTC fires: Where's the inferno? 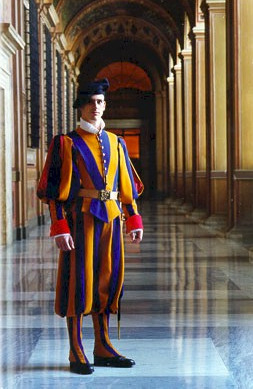 One of the Vatican's famed Swiss Guards stands before the entrance of its Secret Archives. A Jewish coalition is threatening a lawsuit to gain access to archival files. The announcement comes less than a week after John Paul II hosted over 130 Jewish leaders, the most ever at the Vatican. A Bronx-based Jewish group announced plans Thursday to sue the Vatican to force the opening of secret archives that might identify thousands of Jewish children baptized as Catholics to save them from the Nazis, and never returned to their families. "As long as the children of all those murdered at Auschwitz do not know their true identities, and as along as the murdered at Auschwitz have descendents who still do not know their true lineage, how can we truly say that Auschwitz has been liberated," said Rabbi Shmuel Herzfeld, vice president of the Coalition for Jewish Concerns. "We want our children back." Big Brother or the Mark of the Beast? 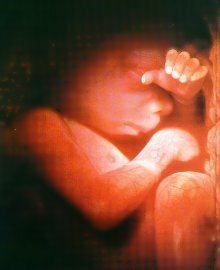 Medical Marxism: wave of the future?